1. Professor of ENT (Group-A) - M.S (ENT) or an equivalent degree recognized by Medical Council of India. 10 Years of Experience in Post Graduate teaching & Clinical work in a recognized Institution / Hospital. 4. Reader in ENT - M.S (ENT) or an equivalent degree recognized by Medical Council of India. 5 years of experience in Post Graduate/Graduate teaching & Clinical work in a recognized Institution / Hospital. 6. 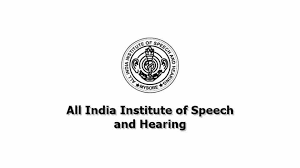 Reader in Speech Sciences - Post Graduate with Ph.D in the relevant Subject/Discipline or its equivalent. 5 years of experience in Post Graduate/Graduate teaching or research at any university or national institution. 7. Chief Accounts Officer (Group-A) - Post Graduate in Commerce or M.B.A with Specialization in Finance from a recognized University or A.C.A/I.C.W.A. 9. Special Educator (Group-B) - Diploma in early child education / Child Development or B.Ed in Special Education or Other Equivalent qualification recognized by RCI. 10. Stenographer Grade I (Group-B) - Bachelor degree of a recognized university. English Shorthand Sr. Grade -Should have a speed of 120 wpm. English typing senior grade -should have a speed of 40 wpm. 5 years experience as Grade II stenographer preferably in State/Central Government Organization. They have to pass test in computer application, and Stenography at 120 wpm. 11. Library & Information Assistant (Group-B) - Degree of a recognized University with Diploma in Library Science. 12. Executive Assistant Grade II (Group-B) - Bachelor Degree of a recognized University Skill Test -Short hand: Dictation 10 minutes. @ 100 wpm, Transcription 40 minutes on Computer. 4. Reader in ENT - Level 11 of pay matrix under VII pay commission. 5. Reader in Speech Pathology - Level 11 of pay matrix under VII pay commission. 6. Reader in Speech Sciences - Level 11 of pay matrix under VII pay commission. 7. Chief Accounts Officer (Group-A) - Level 11 of pay matrix under VII pay commission. 8. Lecturer in Speech Science (Group-A) - Level 10 of pay matrix under VII pay commission. 9. Special Educator (Group-B) - Level 6 of pay matrix under VII pay commission. 10. Stenographer Grade I (Group-B) - Level 6 of pay matrix under VII pay commission. 11. Library & Information Assistant (Group-B) - Level 6 of pay matrix under VII pay commission. 12. Executive Assistant Grade II(Group-B) - Level 6 of pay matrix under VII pay commission. 13. Lower Division Clerk (Group-C) - Level 2 of pay matrix under VII pay commission.